Android, iPhone, iPad and HTML 5 apps are changing the landscape for us amateur musicians by providing inexpensive (often free) apps to all our devices. 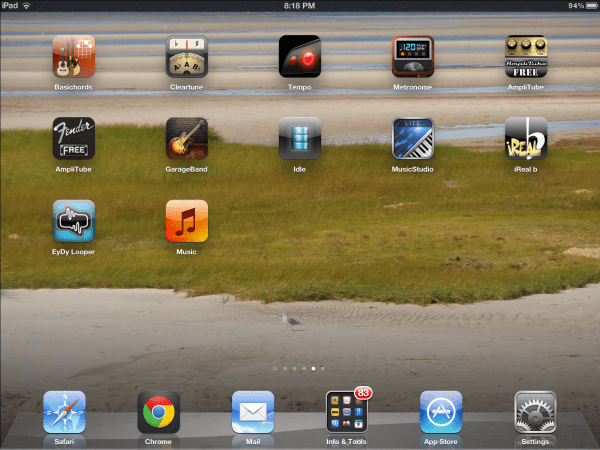 I obtained the new iPad 3 when it came out and have been loading it with music related apps. Now it’s time to share what I’ve found. Before I do I should mention that some of these apps are available on both android and Apple devices as well as apps that can be added to the Chrome browser. A caution is not all iPad apps work on the iPhone, though many work on all apple devices. I have an iPad but an android phone so you can only be sure the apps I review work on iPad. The first thing when playing your guitar, ukulele, mandolin or whatever … is to get the instrument in tune. 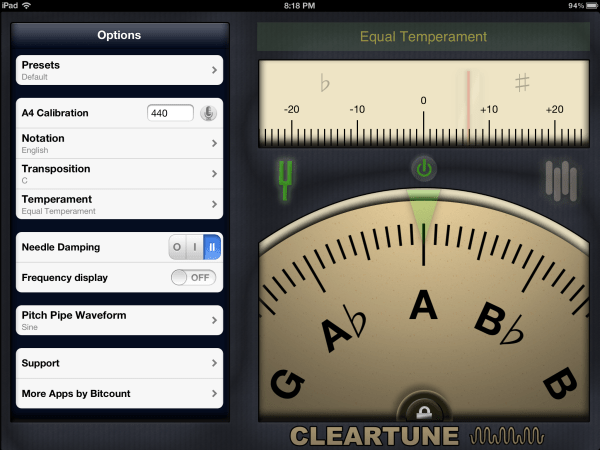 There are a number of free and paid tuning apps. 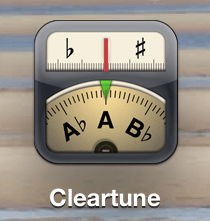 I’ve tried several and settled on Cleartune. It costs $3.99. The app has a spinning dial to show you what note you are playing as well as a cent scale with needle above the dial. This works very well. My only complaint is even when Needle Damping is set at II (highest), there is still a lot of needle bounce. This could be due to the sensitivity of the microphone on the iPad. The next thing you might need to know after you’ve tuned your instrument is how to play a chord. Nearly two years ago I wrote a five part series on how to learn how to play a chord. It included desktop and online chord tools. I briefly mentioned tools available for smart phones. There were no tablets at the time. My have things changed. 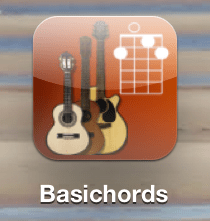 Of the many chord tools available, the one I recommend is Basichords by Tekartik. It is free (ad supported – it looks like you can remove the ads by purchasing the app for $1.99). It includes the major seventh form I required in my original series on chords, so it passes my test. It has most chord forms you will need, though of course it doesn’t have everything. One of the best features for me is that it covers every stringed instrument I own. 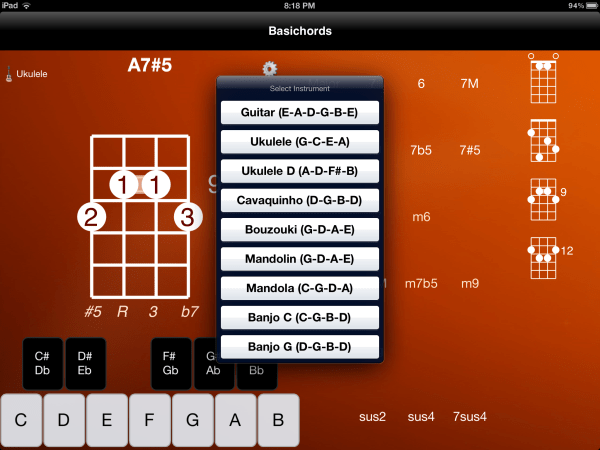 Thus, not only guitar chords, but ukulele, mandolin and banjo chords. Click on the image to left to enlarge the image and see the complete list of instruments the app supports. If you enable sound, you can hear each chord being played when you click on it. Another nice thing about this app is it is available for android and chrome browsers. So you can have it every where. Once you start playing, you might want a metronome to keep you in time. Metronomes are essential for practice. Remember, start slow and aim for accuracy when learning something new. Then speed up the metronome only as far as where you can keep pace without mistakes. If only I practiced like that! 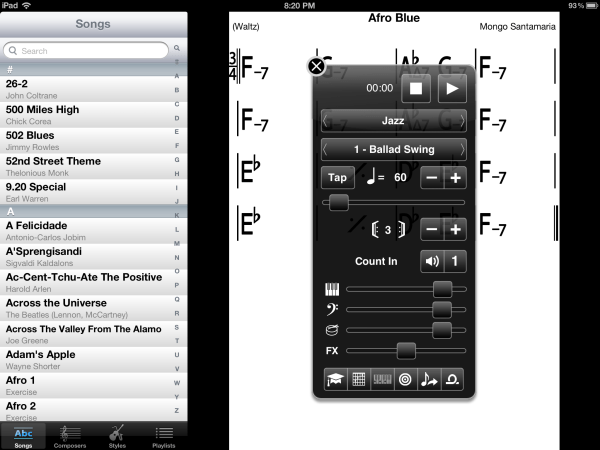 Again, there are several metronome apps to choose from for iPad. As you can see from my home screen shot I’ve currently have two apps installed. But I’m only going to tell you about the better one. 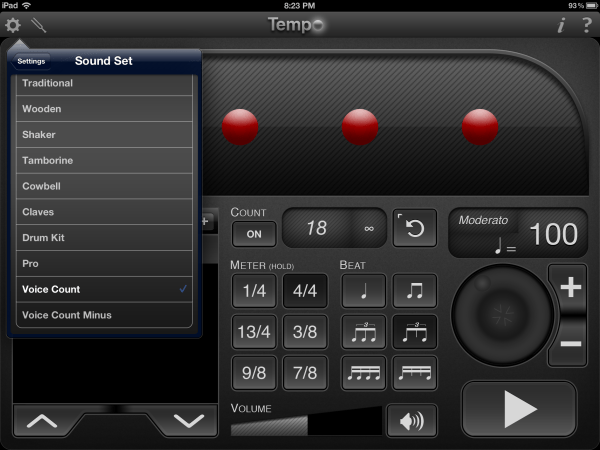 My preferred metronome app is Tempo. It costs $1.99. It has more setting, is easier to control and has better sounds than the other apps I’ve tried. You can choose from a number of sound combinations for marking the beats and indicate which beats are accented (downbeat). Perhaps one of the coolest features is you can have the app speak a synthesized voice for the beats. The voice will even indicate 8th notes and triplets as “one and two and …” or “one and a two and a …”. Want to practice with a backing band? I wish I could tell you there were great apps out there for that, but I can’t. 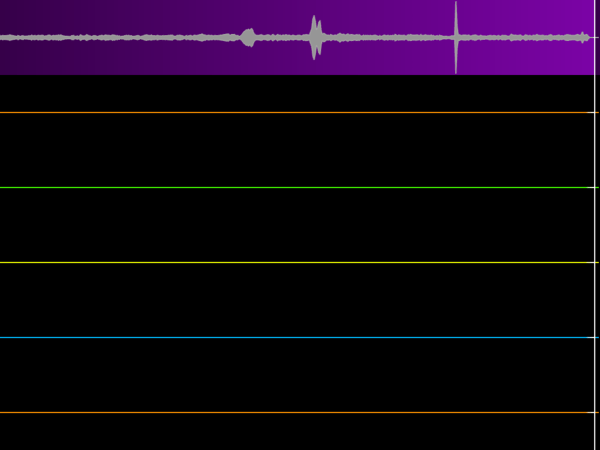 I love Band-in-a-Box (BIAB), the best accompaniment app for Mac or Windows. But don’t bother getting the iPad app for Band in a Box because the app only works as a controller for Band-in-a-Box on your Mac or Windows computer. Of course if you already own BIAB on those platforms and need a remote controller, then go ahead. 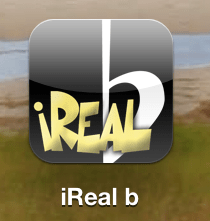 The closest app I can find to fulfilling this need is iReal b. As apps go, this is one of the more expensive ones. Still, it is only $7.99. In app purchases to add styles for play back vary in price up to about $5.99. 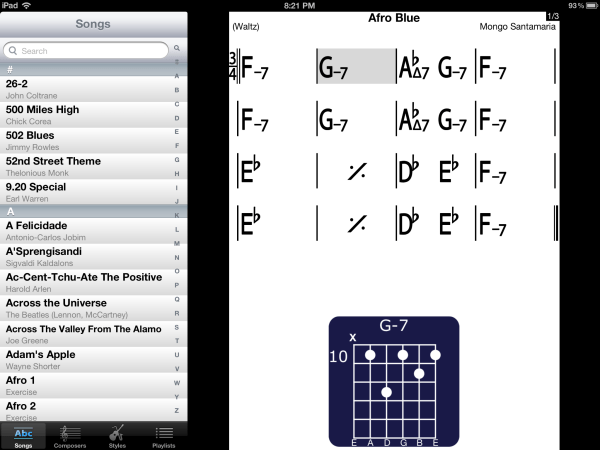 There is also an in-app add in that will show guitar or piano chord diagrams for the chords in a song. There are thousands of user supplied tunes that can be downloaded from a forum from within the app. These cover just about every genre including country, popular, jazz and blues. See above image for example of song list and search (on left – click image to enlarge). All you get are the chords, key and time signatures and a suggested accompaniment style. You can modify any or all of those to suit your preferences (right side of above image). 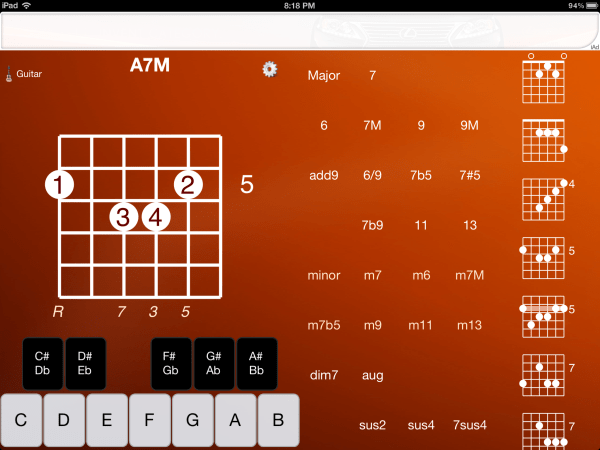 What the app gives you are chord charts – like in a fake book – for thousands of songs AND the ability to play back the chords with a backing arrangement so you can play along. You can even turn off the volume for selected instruments on the playback. You can also create your own “fake” sheets with an editor for entering the chords and other information, then share it with others. Note that when your iPad is turned vertically, the song list is hidden and the score is shown full screen. My main complaint so far is that the accompaniments are uninspiring, especially if you are used to Band-in-a-Box. However, the jazz in-app purchase includes a fairly good Gypsy Jazz guitar comping accompaniment if you’re into that type of music. The other thing to be aware of, is the primary audience for this app are Jazz musicians. 1 One consequence of this is the nomenclature used for chords. If you aren’t used to reading jazz charts you may be confused by G-7 (G minor 7) or a chord with a triangle after it’s name (major). I was blown away the first time I saw a musician use a looper in a live performance. If you aren’t familiar with the technique, a looper electronically records one or more phrases then plays them back on command. You can create a rhythm and then overlay it with a bass part. You can add chords or background vocals and accompany yourself. The least expensive hardware looper is about $200 from Boss 2. 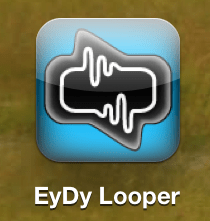 But you can purchase Everyday Looper (EyDy Looper) from the App store for $5.99. No, it won’t have every feature that the $200 pedal has, but for $5.99 it’s pretty impressive. The biggest obstacle is learning how to add a track when you need two hands to play your instrument. There’s no foot switch. The answer is to generate a click track (metronome count) of some specific duration. 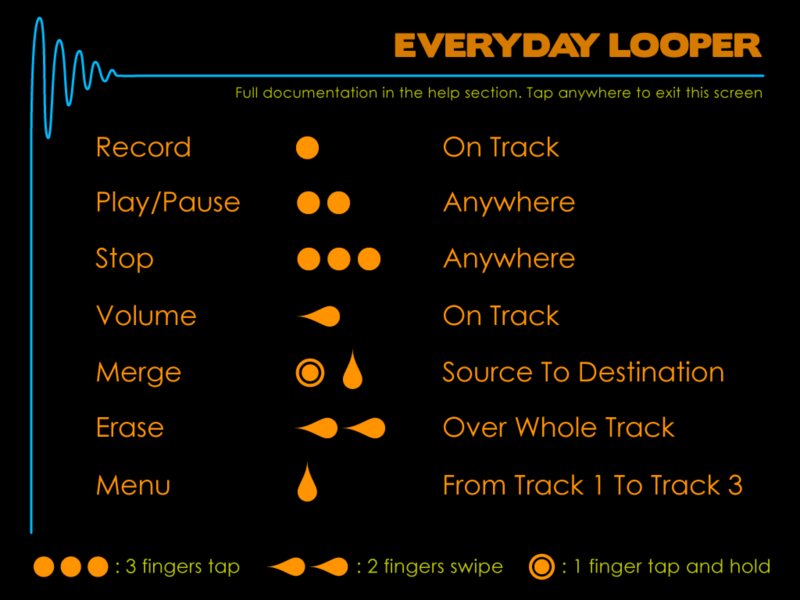 New tracks can be recorded at the beginning of each loop. Arm the track you want to record and wait for the click track to repeat, then record. Jazz musicians are also a primary audience for BIAB.